As people approach their 50th birthday, it is natural for them to wonder where in the world the time has gone. They begin to reflect on the milestones that have passed throughout their lifetime and wonder of the few milestones left. Fifty is a good age. It is the perfect time to take stock of everything in your life and to begin to recharge from the fifty years of accomplishments that have been met, as well as the goals for which you are still striving. When people turn fifty, what they do for the next few years until the reach the age of retirement are essential to determine how well they can enjoy those retirement years. 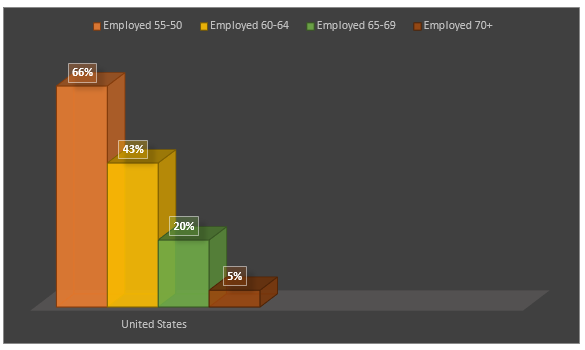 Most people already have a financial plan in action when they reach the age of fifty. This plan includes investing a set amount of their earnings on a regular basis. Turning fifty should be more about making necessary changes and seeing where you are financially, rather than developing a plan from scratch. As life happens, goals change. Sometimes you may consider that you need to move closer to your family, or you realize you have never left your small town and would like to see a little more of the world. Financial planning provides you with the freedom that you need to determine the next steps in your life. This opportunity offers you the chance to avoid having to work or struggling with not having enough money saved. Instead, you can look at you can look at your financial plan, re-evaluate, and make the necessary changes. 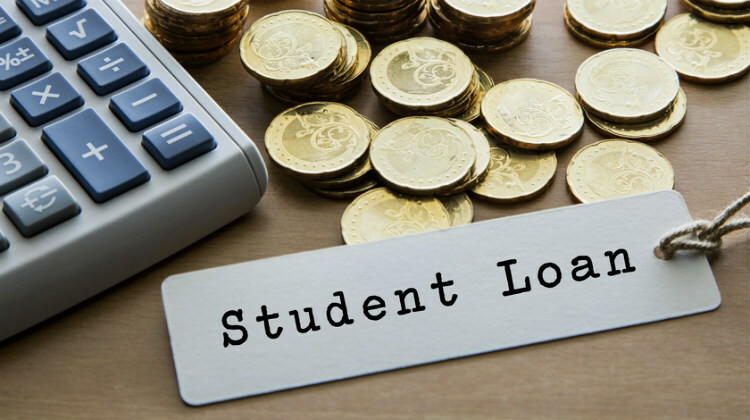 Another time that you may want to reconsider your financial plan is when all of your children have gone and are out of the house, whether at a college or working. You want to make sure that you focus on increasing the cushion that you have until the next time you need to re-evaluate your financial standing. With the current volatility in the markets, there is no telling what the future holds. 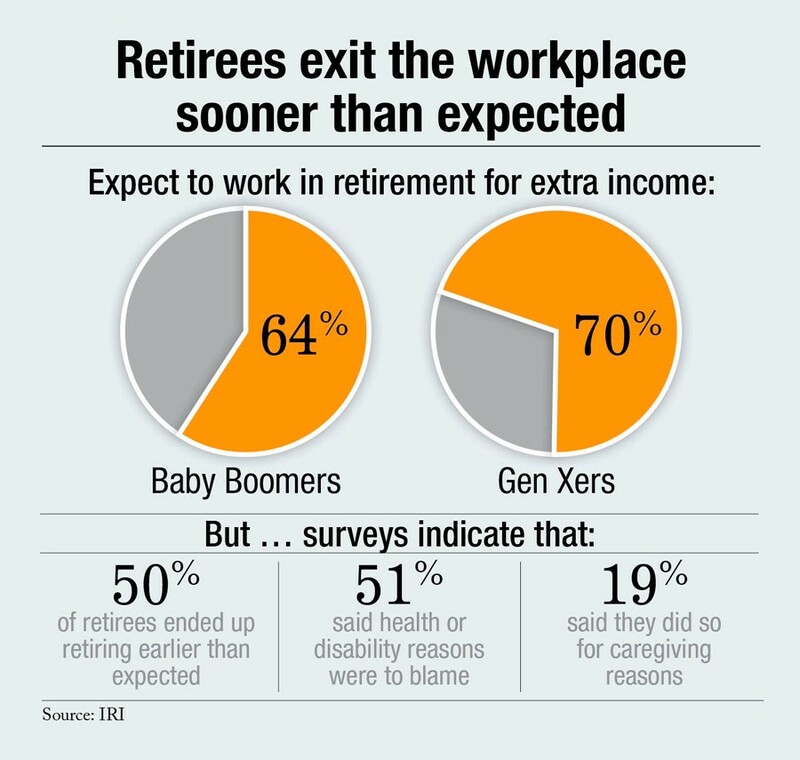 Some individuals know that they want to retire eventually, and others want to stay with the job they have until they day they die. It is essential that you think about the passions you hold in life, and plan for ways to ensure that you can do the things you want to do before it’s too late. 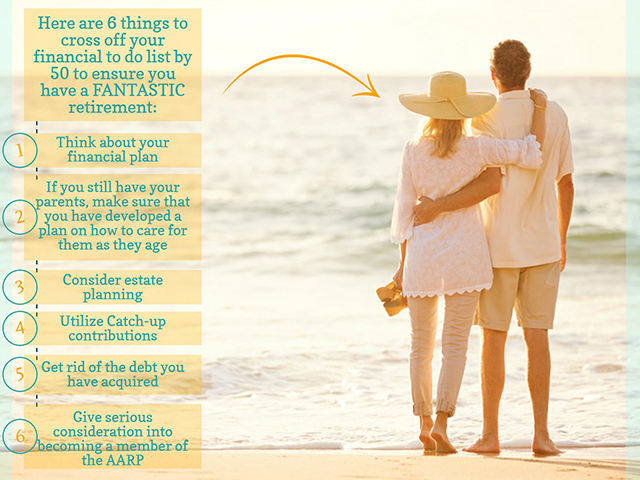 So here is a list of 6 Things To Cross Off Your Financial To Do List By 50 to ensure you’re able to enjoy your retirement. If you still have your parents, make sure that you have developed how to care for them as they age and enter into the last stages of life. As you reach the age of fifty, you should realize that this is the age most individuals begin addressing some of the critical decisions and questions about their parents, if they are still living. Everything from the consideration of long-term care to planning of the estate should be considered. It is no secret that talking about the end of your parent’s lives can be a difficult concept. However, you cannot avoid the topic forever, and now is the time that you need to ensure you have begun making the proper plans. If your parents have already planned everything, then you are very lucky. Especially if they kept you informed of what they wanted. This is because you know what to do, what they expect, and what they want. This process can be even more challenging if your parents live far away from you. It can get to the point that every time a family member calls, you wonder if something happened to your parents. You should sit down and talk with your parents and siblings and have this critical discussion and ensure that the essential plans have been made. You never know what is going to happen when you walk out your front door. 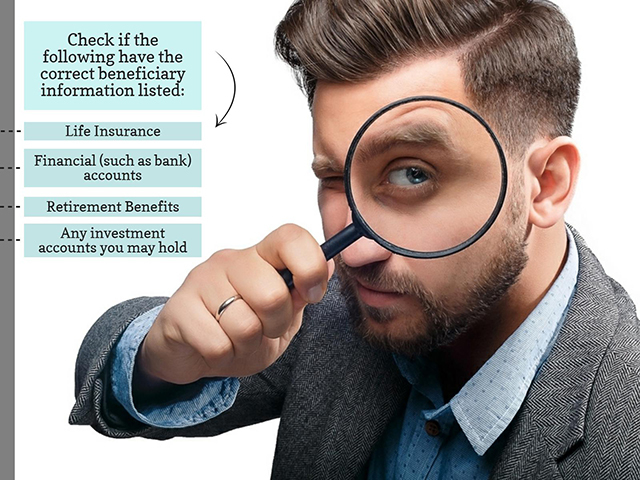 As you reach the age of fifty, it is the perfect time to look into the beneficiaries you have chosen and updating such information as necessary. Think about whether or not you remarried, and when your will was last updated. Is your new spouse named as the beneficiary, or is your ex-wife listed as the one who will receive everything if you pass unexpectedly? You also want to consider, if you have any younger children, who will care for them. If something tragic occurs, you want to make sure that everything is set to transition smoothly. Your loved ones will already be having to come to terms with losing you, and you want to ensure that they do not have added stresses that could have been avoided if you had only planned when you had the chance. 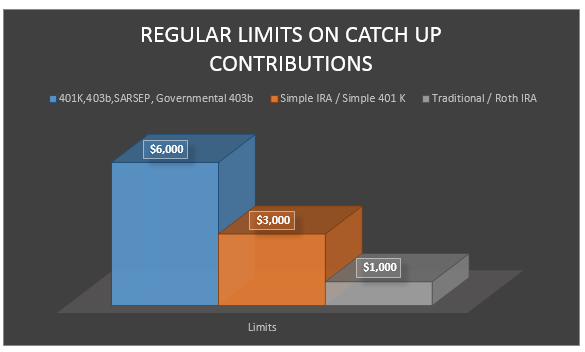 When you turn fifty years old, the Internal Revenue Service says that you can contribute catch-up contributions to the retirement accounts you hold. People that are closing in on their retirement are encouraged to save more by Congress through the act of permitting higher amounts. 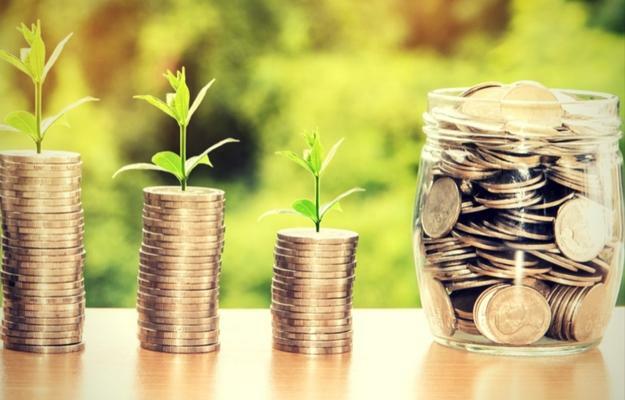 However, you have to wait until you reach the age of fifty-five before you can begin using Health Savings Account catch-up contributions of $1000. You should plan to utilize catch-up contributions to their full advantage. 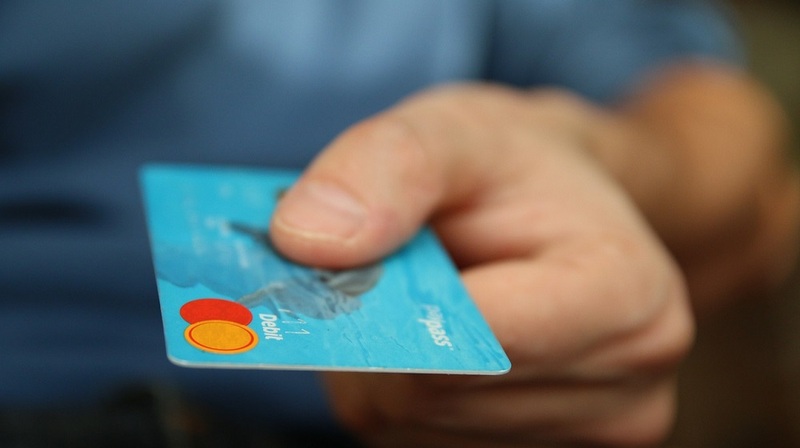 When you are in your younger years and handle your debt responsibly it can have significant benefits to your credit. 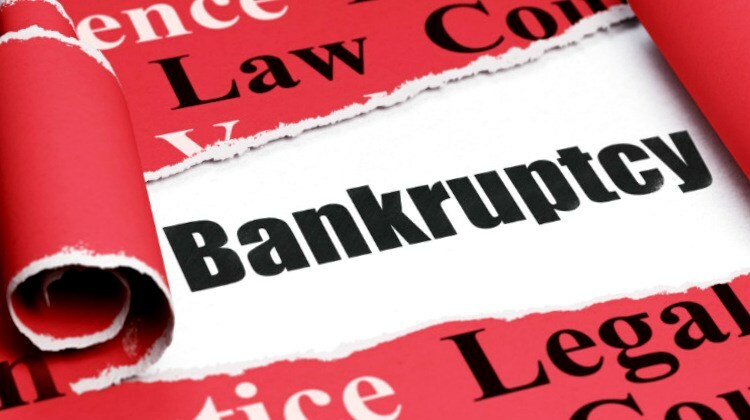 However, as you begin to grow older, you want to try and eliminate the debt that you have acquired over the years. 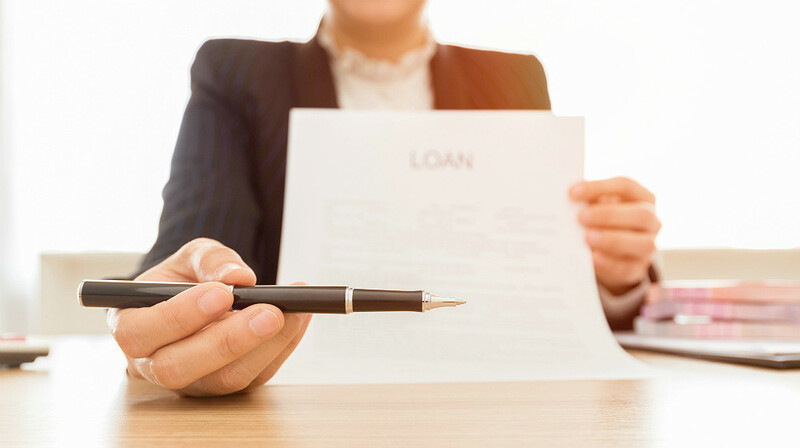 Especially after your children have left the house, it is important that reduce or eliminate your debts. 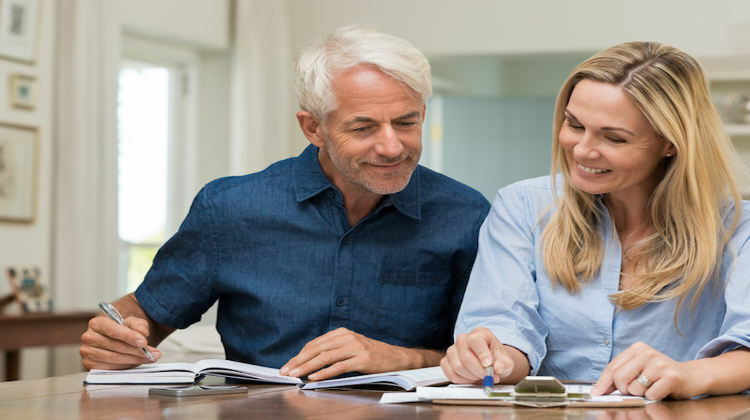 This will allow you to remove pressure from the savings you have for your retirement years, and maximize the possibilities of what you can do after retirement. You can consider downsizing the home you are living in, and work on getting out from under the pile of debt you have. 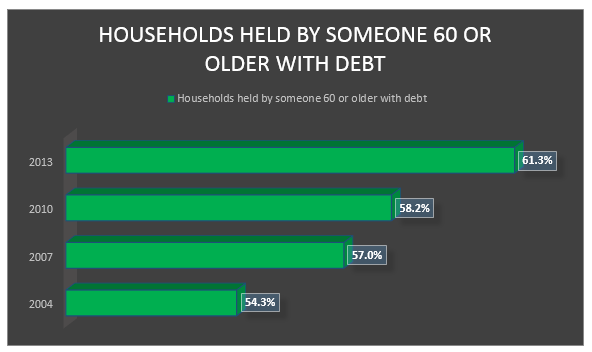 Statistics show that a vast majority of seniors are retiring in debt. Many organizations that are aimed at addressing the needs of senior citizens will not allow you to join until you are fifty-five years old. The AARP, however, will enable you to become a full member for a $16 annual fee when you reach the age of fifty. There are numerous benefits to joining the AARP. One is that you will receive discounts on travel and on the amount you pay for your auto insurance. You will also be offered discounts from hundreds of different places. This means that the fee will be earned back by simply going out to eat at one of your favorite restaurants that offer discounts to members of the AARP or by shopping at some of the stores you love. When you first look at the steps above, it may seem like a lot of work awaits you at a time when you are ready to begin celebrating half a century of life. However, if you tackle these things when you turn fifty, you ensure that you will enjoy a higher quality life as you enter into your retirement.